What if there was a healthy and safe way to make your body think it was fasting and to gain all the benefits associated with calorie-restriction, but without having to stop eating? The benefits of fasting are well-documented but for any people the thought of giving up food and surviving solely on water makes the idea of fasting a no-go. Step up ProLon®, a ground-breaking new five-day plat-based meal programme that nourishes the body while convincing it that it is in full- on fasting mode. Known as a Fasting Mimicking Diet (FMD), ProLon® means that for the first time in history fasting with food is possible. Developed at the Longevity Institute of the University of Southern California (USC) and under the sponsorship of the National Institute for Aging and the National Institute of Health, ProLon® induces the body to protect itself and rejuvenate in response to five consecutive days of fasting. Water only fasting can be risky and challenging. The Fasting Mimicking Diet (FMD) is a new category in nutrition that is scientifically proven and clinically tested to mimic fasting and its benefits including cell regeneration, healthy aging, and fat driven weight loss. ProLon® meals come in five small boxes (one for each day) that include plant-based energy bars, soups, a variety of snacks, drinks, and supplements, all studied and carefully designed to nourish your body and promote positive changes in metabolic markers, cellular rejuvenation, reduced inflammation, and healthy aging. ProLon ingredients are plant-based and do not contain any additives, preservatives* or chemicals. They are also gluten free. The daily caloric intake with ProLon is between 770 and 1100 calories from healthy ingredients that maximise nourishment and provide a pleasant eating experience. ProLon is comprised of low-protein, low-carbohydrate, and high good fat ingredients to help the body protect and repair itself naturally, bringing long-term health benefits. This 'fasting with food' program features meals ranging from 770 to 1,100 calories per day, packaged in convenient grab-and-go boxes that include energy bars, soups, a variety of snacks, drinks, and supplements. 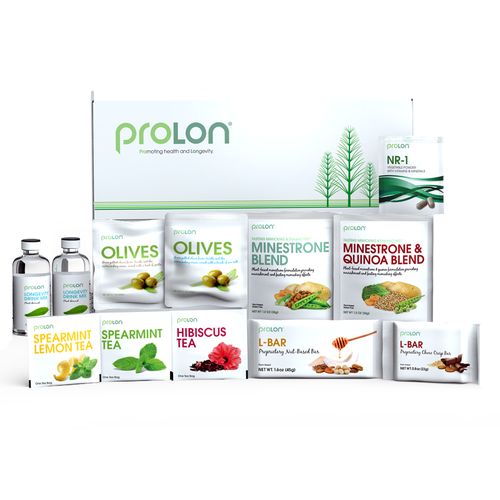 ProLon's plant-based ingredients consist of fresh olives, vegetables, nuts, seeds, dark chocolate, and herbal teas. "ProLon® is the first impactful yet practical and natural intervention that enhances the healthy part of our life by optimizing the way we age," says Dr. Valter Longo, chairman and founder of L-Nutra and the director of the Longevity Institute. "Fasting done periodically is a very powerful and natural way to help the body first recover from the incremental damages inflicted by unhealthy lifestyle and then to rejuvenate its cells and systems. Based on over a decade of research and development, ProLon® is scientifically proven to enable people to live longer, healthier lives." According to a clinical trial published in Science Translational Medicine, researchers tested the effects of three ProLon cycles (five days per month) on stimulating the body’s own stem cells, on metabolic markers and on risk factors associated with aging and age‐related diseases. Findings in humans confirmed mice studies showing a spike in circulating Stem Cells and leading to delayed aging by promoting regeneration in multiple systems. Body weight, BMI, total body fat, trunk fat, waist circumference, systolic and diastolic blood pressure, cholesterol, and insulin‐like growth factor 1 (IGF‐1), C-Reactive Protein (a marker of inflammation) were significantly reduced, particularly in participants at risk for diseases, while relative lean body mass (muscle and bone mass) was increased. Low levels of IGF-1 are associated with a lower risk of cancer and diabetes. No serious adverse effects were reported. "ProLon Fasting Mimicking Diet is a natural, science backed way to positively impact our health and ageing processes, " says Kim Pearson, Nutritionist and UK ambassador for ProLon. "Periodic fasting is a powerful practice for helping the body thrive, despite negative impacts from our modern lifestyles, exerting positive effects on our cells and systems throughout the body. Based on over a decade of research and development, ProLon® is scientifically proven to enable people to live longer, healthier lives."